Live videos show a different story than yours! But good try anyways. What really happened outside Turkey's US Embassy? what happened outside the embassy building. and Turkey, started to respond to the group's verbal harassment. where they were. The Turkish citizens objected to this. sight to the White House. Both groups shouted slogans and afterwards dispersed without incident. park next to the building half an hour earlier. the YPG, the armed Syrian offshoot of the PKK/PYD. responded with their own slogans. swearing and insults against Erdogan and the Turkey supporters. gathering with no notice, if they were planning to make a scene. around 10 police officers outside the embassy. the police chief at the scene what happened and who hit him. arrested or the situation could escalate. arrested, continued with his swearing and insults. being sought by both federal agents and the D.C. metropolitan police. but instead forced the Turkish supporters back onto the sidewalk. but not the PKK supporters. president's security detail stepped in. After security interceded, the group dispersed. the altercation and the terror group supporters were the victims. Just like before it will be forgotten very soon, thanks to the Incirlik! WASHINGTON, (A.W. )— During an interview with Fox News Sunday’s Chris Wallace, United States Secretary of State Rex Tillerson said that the U.S. had summoned the Turkish Ambassador to the State Department to express “dismay” regarding the May 16 attack against peaceful demonstrators outside the Turkish Ambassador’s residence. During the May 21 interview, Tillerson also said that an investigation into the incident is ongoing. “Well, we did call the Ambassador of Turkey into the State Department to discuss what occurred with them and express our view that this is certainly unacceptable,” said Tillerson when asked if he was going to take action against the pro-Erdogan groups and members of his security detail who were responsible for the attacks. “There is an ongoing investigation, Chris, and we think we’ll wait and see what the outcome of that investigation is. But we have expressed our dismay at what occurred at the Turkish Embassy,” Tillerson added. When Fox News mentioned Senator John McCain’s (R-Ariz.) call to expel the Turkish Ambassador from the U.S., Tillerson responded that the investigation must conclude before making any such decisions. Poor bodyguards their feelings are hurt, give me a break! ANKARA, Turkey (AP) — Turkey summoned the U.S. ambassador on Monday to protest what it called “aggressive and unprofessional actions” by American security personnel against Turkish bodyguards in Washington during President Recep Tayyip Erdogan’s visit last week. The action appeared to be in retaliation to calls in the U.S. for strong action against the Turkish security officers who were seen hitting and kicking protesters outside the Turkish ambassador’s residence in Washington during Erdogan’s visit. A video shared on social media showed Erdogan watching the melee. Two Turkish bodyguards were briefly detained after the incident but later set free and returned to Turkey. The United States summoned the Turkish ambassador to raise concerns over the altercation, but President Donald Trump’s administration is facing growing calls for a forceful response to the violence by Turkish security officials on American soil. The incident added to the already strained ties between the U.S. and Turkey — two NATO allies who are at odds over a U.S. policy to back Syrian Kurdish rebels fighting the Islamic State group in Syria. Turkey considers the fighters to be terrorists. A Turkish Foreign Ministry statement said U.S. Ambassador John Bass was given a “written and verbal protest” over the treatment of two security officers that it said were “contrary to diplomatic rules and practices.” The statement said the two officers were part of Foreign Minister Mevlut Cavusoglu’s security detail. Just after news broke that he had been summoned, Ambassador Bass was at the airport in Ankara, where he greeted U.S. Ambassador to the U.N. Nikki Haley as she arrived on a previously scheduled trip. Last week’s incident wasn’t the first time violence accompanied a visit by a Turkish leader to the U.S. Last year, a similar fight erupted outside a nuclear security summit in Washington, attended by Erdogan. In a surprising move of diplomatic audacity, Turkey is protesting what the country calls “aggressive” U.S. action during a brawl outside the Turkish embassy last week. “A written and verbal protest was delivered due to the aggressive and unprofessional actions taken, contrary to diplomatic rules and practices, by U.S. security personnel,” Turkey’s Ministry of Foreign Affairs said Monday in an official statement. Just what were these aggressive and unprofessional actions, according to the Turkish officials? On Tuesday, members of Turkish PM Recep Erdogan's security detail attacked a group of pro-Kurdish and Armenian protesters who were gathered outside the Turkish ambassador's residence. Local D.C. police quickly intervened to stop them. Eleven people were injured, including a police officer, and two Turkish officials were briefly taken into custody, then reportedly released due to diplomatic immunity. Both majority Muslim Kurds and majority Christian Armenians have longstanding grievances with the Turkish government. Armenians take issue with Turkey's history of backing Azerbaijani territorial claims. Kurds have long protested what they view as second-class standing in Turkey and Turkey's extremely strong opposition to the creation of an independent Kurdish state. The Turkish foreign ministry did not go into specifics of how they thought D.C. metro police should have handled the incident, which occurred outside the Turkish embassy grounds. The truth is out there in videos for all to see, and erDOGan will get away with it due to interests. After attacking peaceful demonstraters on U.S. soil, Turkey has the temerity to say that it hopes “in the future, appropriate measures” will be taken to prevent violence. Here’s an idea: Erdogan and his thugs can stay home. The statement issued by the Turkish Embassy trying to justify the actions of President Recep Tayyip Erdogan’s bodyguards at a protest outside the ambassador’s residence is almost as outrageous as the violence that occurred Tuesday. It is replete with half-truths and outright lies. But it serves a perverse purpose: providing unvarnished insight into the mind-set of Turkey’s authoritarian government, where reason and the rule of law have been supplanted by the dictates and propaganda of Erdogan. The sickening images of protesters being chased, kicked and bloodied by black-suited members of Erdogan’s security detail have, by now, been widely circulated and, we hope, implanted in public awareness as a stark example of the kind of oppression people in Turkey suffer on a daily basis. Breaking its silence amid mounting criticism (including the Turkish ambassador being summoned to the State Department for a meeting), the embassy Wednesday night released an unrepentant statement that shamelessly tried to blame the protesters. The release claimed the demonstrators were affiliated with the PKK, a group designated by the United States and Turkey as a terrorist organization, and that, lacking a permit, they had aggressively provoked Turkish Americans who had gathered to greet Erdogan. It first should be pointed out that the protesters, their right to dissent protected by the U.S. Constitution, needed no permit and were breaking no rules. Demonstrations on public sidewalks are permitted without a permit as long as they don’t block the walkway and fewer than 100 people are expected. Tuesday’s protesters numbered about two dozen and, according to organizers, had no involvement or affinity with the PKK (and even if they did, that would be a matter for American law enforcement, not Erdogan’s goons). The group included women, children and elderly people. It is apparent that the only threat posed by the protesters was their message of dissent against Erdogan. A video that surfaced on social media Thursday shows the melee breaking out with Erdogan smugly watching. Audible are chants of “Terrorist Erdogan” and “Baby-killer Erdogan.” Signs carried by some Kurdish activists expressed support for jailed Erdogan opponents: “Free Selahattin Demirtas” and “Free Figen Yuksekdag,” co-leaders of the third-largest political party in Turkey, the HDP. 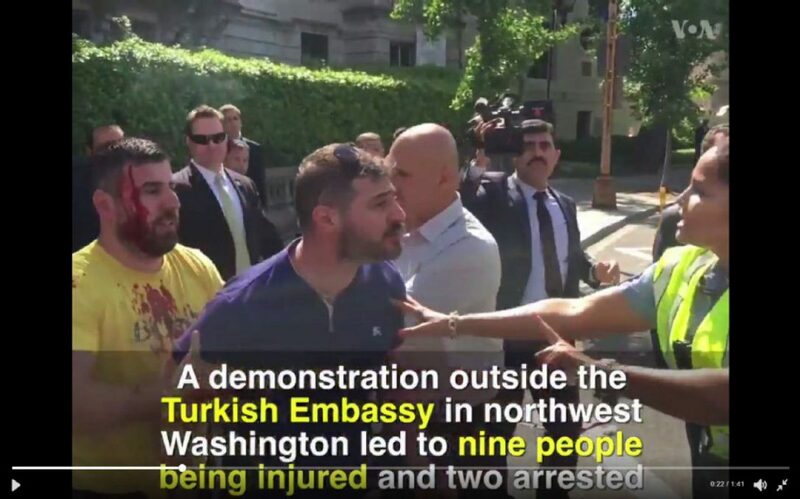 The embassy’s bogus claim that the violence was the result of Erdogan supporters acting in self-defense is refuted by the videos, which show the bodyguards as aggressors as District of Columbia police try to separate them from protesters, and by the fact that some members of the detail were detained by authorities before being released on grounds of diplomatic immunity. What occurred Tuesday, D.C. Police Chief Peter Newsham unequivocally told us, was “an unexpected assault on peaceful protesters.” It is infuriating then that the Turkish government — rather than apologizing for its unlawful behavior — has the temerity to say that it hopes “in the future, appropriate measures” will be taken to prevent violence. Here’s an idea: Erdogan and his thugs can stay home. Former Turkey apologist becomes Turkey lobbyist! Some people never change. MIAMI — President Donald Trump’s longtime Florida lobbyist, Brian Ballard, has expanded his practice globally and just signed a $1.5 million contract with the government of Turkey, which will be represented by the firm’s new big hire, former Florida Congressman Robert Wexler. Ballard Partners' Turkey contract, inked Friday, comes on the heels of two other international clients signed by the firm: A March 6 $900,000 contract with the Dominican Republic and an April 1 $240,000 contract with the Socialist Party of Albania, the ruling party in the Balkan nation. "I'm excited about the firm's growing international practice and look forward to working with this important US and NATO ally,” Ballard, who still speaks to Trump on occasion after representing the Trump Organization for years in Tallahassee, said in a brief written statement. The contract with Turkey is the firm’s highest profile foreign client and could be its most controversial amid unrest in the nation under President Recep Tayyip Erdogan. Meantime, amid a special counsel’s examining of alleged Russian meddling in the 2016 U.S. presidential elections, Trump’s former national security adviser, Mike Flynn, has come under increasing scrutiny for his Turkish lobbying, which was also linked to a Russian oil deal. Wexler, a Democrat who served in Congress from 1997 until 2010 and helped found the Turkey Caucus in the U.S. House nearly 20 years ago, was circumspect in addressing the melee. “It’s not debatable that peaceful protest in the United States of America is sacrosanct,” Wexler said. Wexler is new to lobbying and joined Ballard Partners in March. He’s still serving as president of the S. Daniel Abraham Center for Middle East Peace, a Washington-based think tank devoted to Israeli-Palestinian relations. Wexler said he saw his role representing Turkey as one in which he tries to advance the interests of both nations, which have been longtime allies. Ballard Partners' trifecta of foreign clients follows its decision to expand in Washington this year after the election of Trump. I highly doubt it will amount to anything! WASHINGTON—Congressional uproar over the May 16th brutal beating of peaceful American protesters in Washington, D.C. by Turkish President Recep Erdogan’s security forces pushed into a second week, with top U.S. Senate appropriators – Lindsey Graham (R-S.C.) and Patrick Leahy (D-Vt.) – threatening to cut U.S. assistance to Ankara if the matter is not given “the highest attention and consideration it deserves by the Government of Turkey,” reported the Armenian National Committee of America (ANCA). Senators Lindsey Graham (R-S.C.), Patrick Leah (D-Vt.) and Representative Carolyn Maloney (D-N.Y.) are among the top Senate and House leaders condemning the brutal attack by Turkey President Erdogan’s security officers in Washington D.C. In a May 18 letter to Turkey’s Ambassador, Serdar Kilic, Senators Graham and Leahy stressed: “We would like to remind you that peaceful assembly and freedom of speech are fundamental rights in this country. The aggressiveness and brutality demonstrated by the Turkish security personnel are interpreted by many of us as much more than an attack against peaceful demonstrators – it is an attack against these very rights.” The text of this Senate letter is provided below. Across the U.S. Capitol, 29 U.S. Representatives, led by Congressional Hellenic Caucus Co-Chair Carolyn Maloney (D-N.Y), called on the State Department to take swift action and hold perpetrators accountable. “This kind of behavior by a foreign security detail is reprehensible and cannot be tolerated. These actions are not only criminal, they are affronts to U.S. values,” House leaders told Secretary of State Tillerson in their May 19 letter. “Freedom of speech and freedom to protest may be prohibited in Turkey and offensive to the Turkish President, but they are bedrock U.S. principles that must be safeguarded.” The full text of the U.S. House letter is provided below. Congressional co-signers joining Rep. Carolyn Maloney include Representatives: Don Beyer (D-Va.), Suzanne Bonamici (D-Ore.), Robert Brady (D-Pa.), Joaquin Castro (D-Tex. ), David Cicilline (D-R.I.), Katherine Clark (D-Mass. ), Charlie Crist (D-Fla.), Bill Foster (D-Ill.), Raul Grijalva (D-Ariz.), Brian Higgins (D-N.Y.), Jared Huffman (D-Calif.), Daniel Kildee (D-Mich.), Daniel Lipinski (D-Ill.), Zoe Lofgren (D-Calif.), Betty McCollum (D-Minn.), James McGovern (D-Mass. ), Seth Moulton (D-Mass. ), Eleanor Holmes Norton (D-D.C.), Frank Pallone (D-N.J.), Bill Pascrell (D-N.J.), Chellie Pingree (D-Maine), Bobby Rush (D-Ill.), John Sarbanes (D-Md. ), Janice Schakowsky (D-Ill.), Brad Sherman (D-Calif.), Mark Takano (D-Calif.), Nydia Velazquez (D-N.Y.), and John Yarmuth (D-Ky.). These legislators join a broad range of Senate and House leaders who spoke out last week condemning the President Erdogan for the attack, including Armed Services Committee Chairman John McCain (R-Ariz.) who called for Turkish Ambassador to the U.S. Serdar Kilic to be sent back to Ankara. Congressman Don Beyer, who has previously served in the U.S. foreign service as Ambassador to Switzerland and Lichtenstein, also called for Amb. Kilic’s ouster and signed on to this Congressional letter as well. The ANCA has issued a call for concerned advocates—www.anca.org/erdogan—to reach out to President Trump, Secretary Tillerson, and Senate and House legislators demanding the immediate expulsion of the Turkish ambassador. ANCA Executive Director Aram Hamparian was videotaping live at the scene of the May 16th attack, which took place in front of the Turkish Ambassador’s residence where President Erdogan was scheduled to have a closed-door meeting with representatives of The Atlantic Council, a leading think tank in Washington, D.C. which receives funding from Turkey. Hamparian’s video showed pro-Erdogan forces crossing a police line and beating peaceful protesters—elderly men and several women – who were on the ground bleeding during most of the attack. The Turkish language news item is available here. The U.S. State Department called the Turkish Ambassador in for a discussion last week regarding the incident, officially expressing their dismay, calling the actions of President Erdogan’s bodyguards “unacceptable.” President Trump has yet to comment on the matter. Since reporting on the attacks by President Erdogan’s security forces, the ANCA has received threatening phone calls and messages on social media. These intimidation tactics have been reported to the Metropolitan Police and other authorities, and are now under investigation. The protest in front of the Turkish Ambassador’s residence was a continuation of a demonstration held earlier in the day in front of the White House, co-hosted by the ANCA. As President Trump met with President Erdogan, human rights and religious rights groups were joined by representatives of the Kurdish, Yezidi and Armenian communities to call attention to the Erdogan regime’s escalating repression against free press, the Kurdish and other ethnic communities, as well as Turkey’s ongoing obstruction of justice for the Armenian Genocide. We write to you to express our profound dismay at the reported attack by Turkish security personnel against peaceful protestors outside your residence during President Recep Tayyip Erdogan’s recent visit to Washington, D.C.
We would like to remind you that peaceful assembly and freedom of speech are fundamental rights in this country. The aggressiveness and brutality demonstrated by the Turkish security personnel are interpreted by many of us as much more than an attack against peaceful demonstrators – it is an attack against these very rights. This incident is nothing short of an embarrassment for the Government of Turkey, and an unnecessary and self-inflicted strain on our bilateral relations. We encourage local law enforcement personnel to prosecute perpetrators of this attack to the fullest extent of the law, and support the expulsion from the United States of any diplomatic personnel involved. We also ask that you meet with the Department of State, Foreign Operations, and Related Programs Appropriations Subcommittee to discuss this matter further, including potential implications for assistance for Turkey should this matter be given less than the highest attention and consideration it deserves by the Government of Turkey. 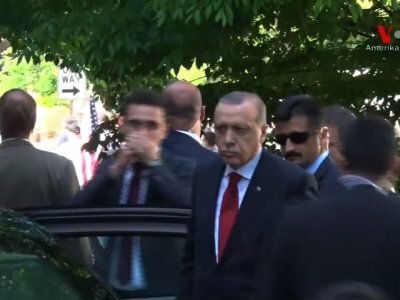 On May 16, members of Turkish President Recep Tayyip Erdogan’s security detail were caught on video brutally attacking protesters outside the Turkish Ambassador’s residence in Washington, D.C. and deliberately disregarding police orders to halt their assaults. The video is incredibly disturbing. We urge you to immediately condemn this outrageous attack in the strongest terms possible and use all tools at your disposal so that these men are denied diplomatic immunity and prosecuted to the fullest extent of U.S. law. Based on the video of the incident, these Turkish security guards should be arrested, prosecuted and jailed. Numerous members of President Erdogan’s security detail kicked, punched, and trampled people holding posters who were standing in a park that is clearly not part of the embassy. These Turkish security guards kicked men and women crouched on the ground and disregarded numerous commands by police to cease and desist. According to news reports, nine people were hurt, including two who were seriously injured and taken to the hospital. The blooded faces on the video are shocking. This kind of behavior by a foreign security detail is reprehensible and cannot be tolerated. These actions are not only criminal, they are affronts to U.S. values. Freedom of speech and freedom to protest may be prohibited in Turkey and offensive to the Turkish President, but they are bedrock U.S. principles that must be safeguarded. Although the State Department’s spokesperson has issued a statement on this matter, more must be done. It is incumbent upon you, as the top diplomat of the United States, to speak out publicly against these actions and, just as importantly, ensure that these men are held fully accountable for their actions. Chairman Ed Royce of the House Foreign Affairs Committee was joined today by Ranking Democrat Eliot Engel and the Majority and Minority Leaders of the U.S. House - Reps. Kevin McCarthy and Steny Hoyer - in introducing H.Res.354, condemning the Turkish government's May 16th attack on peaceful protesters in Washington, DC - reported the ANCA. This bipartisan measure will be considered during tomorrow morning's meeting of the Foreign Affairs Committee. Streaming from the U.S. House Foreign Affairs Committee's Subcommittee Hearing on the violent attacks outside of the Turkish Ambassador's Residence. The full text of the ANCA's Aram Suren Hamparian's testimony before the House Foreign Affairs Committee Subcommittee of Europe regarding the Erdogan-ordered attacks on American protesters. Thank you Chairman Rohrabacher and Ranking Member Meeks for this opportunity to testify about the May 16th attack by Turkish President Erdogan's bodyguards against peaceful protesters outside the Turkish Ambassador's residence. I participated in this peaceful protest at Sheridan Circle and was witness to this brutal assault on Americans and American values. I personally saw unprovoked attacks by President Erdogan's bodyguards and others against civilians protesting the Turkish government's policies. The Turkish President's security detail was large, clearly well-trained, and extremely violent - kicking and punching protesters even after they had fallen to the ground defenseless and, in at least one case, unconscious. I did my best to help the injured and stayed with many of them later that evening while they were being cared for at the George Washington University Hospital's emergency room. Live footage that I filmed for the Armenian National Committee of America Facebook page served as source video for CNN, the Associated Press, and other major media outlets. Our viral video spread news of this incident around the world and, along with excellent video and reporting by the Voice of America and others, helped place a global spotlight upon the Erdogan regime's increasingly violent efforts to suppress dissent, both at home and now, increasingly, abroad. Your leadership in educating your Congressional colleagues and the American public about this outrage is deeply appreciated. At the time of the incident I felt certain that it was an orchestrated attack, launched on orders from above. Video evidence I have reviewed subsequent to the violence, including a frame-by-frame analysis by the Washington Post and an audio analysis by the Daily Caller, confirm my conviction that this attack was, in fact, launched at the direction of President Erdogan. "This is the very type of intolerance that has come to predominate in Turkey, and it is now been exported here. I was here. I saw every bit of this. I saw a group of peaceful protestors in Sheridan Circle - there is grassy area across the street from Turkish Ambassadors residence - they were protesting, exercising their Constitutional right to speak their mind, to hold signs, to share their opinion, to express their views." "They were rushed from across the street by a group of - a pro Erdogan crowd - broke through the police lines, attacked just literally anybody within reach, with their fists and anything else they could get a hold of, and they beat as many people as they could, they left many bloodied, many have been taken to the hospital. This is exactly the type of violence you see in Ankara and they're exporting it here. They're exporting it here. I'm going to repeat myself: It's one thing for the Turkish government to do that to its own citizens, and it's a terrible thing. It's another thing for us, as Americans, to see that exported to the United States, and it was exported to right here to the nation's capital. Right here, blocks from the White House!" The fact that Erdogan would act in such a brazen and brutal manner against Americans during a high-profile visit to Washington, DC offers a chilling insight into the depths of violence his forces visit every day upon those in Turkey who - far from the media spotlight - dare to dissent against his despotic rule. Last Tuesday's aggression by the Turkish government at Sheridan Circle is clearly part of an escalating and very troubling pattern. Having been allowed by U.S. Presidents - past and present - to enforce its gag-rule against honest U.S. remembrance of the Armenian Genocide, the Turkish government is now openly and unapologetically exporting its intolerance and violence to America. Past incidents involving violence by President Erdogan's bodyguards include a 2011 attack on a United Nations security detail and also a March, 2016, assault on protesters and journalists outside the Brookings Institute here in Washington, DC. I took part in last year's Brookings protest and witnessed first-hand the violence visited by President Erdogan's security on people gathered, upon our internationally respected Embassy Row, to exercise their Constitutional rights. President Erdogan is acting with remarkable arrogance and absolute disdain for our country, open disrespect for our police, and outright contempt for the principles that inspire and guide our democracy. The news that the Turkish Foreign Ministry has filed an official protest with U.S. Ambassador John Bass over the conduct of U.S. law enforcement offices is as outrageous as it is offensive. By way of background, our protest in Sheridan Circle followed an early, larger demonstration held across the street from the White House in Lafayette Park. The ANCA co-hosted this protest, along with other civil society groups concerned about a broad array of Turkish violations of human rights, humanitarian standards, press freedoms, and international law. Our Facebook event page was titled, "Protest Against The Erdogan Dictatorship," and invited supporters to "Join supporters of human rights, religious liberty, and regional peace at a rally outside the White House (in Lafayette Park) during President Trump's May 16th meeting with Turkish President Erdogan. Among the issues listed on this page were: Erdogan's post-coup consolidation of authoritarian power; mass arrests of the HDP leadership; vast purge of his political opposition; arrest of record numbers of journalists; restrictions on religious freedom and worship; Wikipedia ban and social media crackdown; aggression against Kurds in Syria and Iraq; anti-American rhetoric and actions; continued military occupation of Cyprus; obstruction of justice for genocide of Armenians, Assyrians/Chaldeans/Syriacs and Greeks, and; illegal economic blockade of Armenia. Among those protesting alongside human rights advocates, Armenians, Kurds, Greeks, and others at Lafayette Park was a religious freedom group seeking Turkey's release of Pastor Andrew Brunson, a U.S. citizen from North Carolina who, after leading a Christian ministry in Izmir for more than two decades, has, since October of 2016, been unjustly imprisoned in Turkey on trumped up charges. Mr. Chairman and Ranking Member, I very much appreciate the opportunity to share my testimony with you today and look forward to answering any questions. I will believe only if its followed by action, otherwise it's only rhetoric! WASHINGTON—On May 25, the House Foreign Affairs Committee unanimously adopted H.Res.354 condemning the May 16 attacks on peaceful protesters by Turkish President Erdogan’s bodyguards, “calling for the perpetrators to be brought to justice and measures to be taken to prevent similar incidents in the future.” Foreign Affairs Committee Chairman Ed Royce (R-Calif.) and Ranking Democrat Eliot Engel (D-N.Y.) were joined by House Majority Leader Kevin McCarthy (R-Calif.) and Democratic Whip Steny Hoyer (D-Md.) in spearheading the Congressional effort, likely to be voted on in the full House in early June. Turkish ambassador's residence in Washington. ground near at the 25-second mark. Erdogan is seen looking on as the attack unfolds. officials, who summoned Turkey's ambassador over the incident. probe before deciding on a more formal response. campaign to take Islamic State's Syrian stronghold in Raqqa. If we, the United States, were to do anything in Syria it should be done with the invitation of the Syrian People through their government. hearings on the recent Washington D.C. attack on demonstrators. and clear – Erdogan must never be invited to the US any more. we receive an official apology from personally Erdogan”, Sherman said. surprisingly, seemingly upon an order. order, something I’ve never seen in America”, he said. Congressmen said the US response must be harsh and definite. Alpkenan Dereci said he and other Erdogan supporters were the “real victims,” though they were seen striking protesters. Toronto residents Alpkenan Dereci and Ahmet Dereci, enthusiastic supporters of Turkish President Recep Tayyip Erdogan, are seen on video joining Erdogan’s security team in striking protesters near the residence of Turkey’s U.S. ambassador. Videos published by the New York Times and other media show that Alpkenan Dereci punched and shoved a protester. They show that the man identified by the Times as Ahmet Dereci punched a protester and then kicked him twice when he was lying defenceless on the ground. The Derecis have not been arrested or charged with any offence. Alpkenan Dereci told a Turkish news agency that they were victims of assault, not perpetrators. Alpkenan Dereci was also on the receiving end of violence during the melee; videos show he was struck in the face by a bullhorn tossed at him after he landed a punch near the head of a protester. His face and shirt were bloodied, and he told a Turkish news agency that he required 17 stitches. People on the pro-Erdogan side were the “real victims” and were “openly assaulted,” Alpkenan Dereci said in a video published by the Andalou Agency. The media, he said, had failed to show that Erdogan’s supporters were themselves attacked. “We cannot understand this,” he said. The melee quickly turned into an international incident. Critics and even supporters of President Donald Trump, who had met with Erdogan earlier in the day, have demanded a forceful diplomatic response from his administration. A spokesperson for the Washington police said Friday that “the investigation remains active.” The probe is being conducted by the police, the State Department and Secret Service. Though Erdogan’s security team committed much of the violence, the civilians not employed by his government are more vulnerable to legal consequences: Erdogan bodyguards are likely protected by diplomatic immunity. D.C. Mayor Muriel Bowser called the confrontation a “violent attack on a peaceful demonstration.” Republican Sen. John McCain said there is “no excuse for this kind of thuggish behaviour” and called for the expulsion of the Turkish ambassador. A bipartisan group of senators called on the State Department to revoke the ambassador’s credentials if Turkey did not waive immunity for the people involved. The Turkish government, meanwhile, summoned the U.S. ambassador to complain about the actions of Washington police officers. Turkey said its side acted in “self-defence,” but multiple videos contradict this claim at least in part. They show Erdogan’s security team pushing past police officers to punch, kick and, in one case, choke protesters who were not posing a threat. The Derecis were described by the Times as cousins; the Star could not confirm this. They are highly visible in videos of the clash on account of their T-shirts: Alpkenan in yellow and Ahmet in purple. At one point, Alpkenan, his face and shirt bloody, holds back Ahmet, who is shouting at a police officer. Two people were arrested at the scene, one for aggravated assault and one for assault on a police officer. At least 10 people were injured. Alpkenan Dereci could not be reached for comment through Facebook and Twitter. Ahmet Dereci, whose Facebook and LinkedIn pages say he owns an electrical contracting company in North York, declined to respond to a request for comment. “I don’t believe he’s able to talk, or he’s not going to return any calls or emails at the moment,” said a man who answered the phone at the company. The Derecis are vocal supporters of Erdogan on their Facebook pages and in Toronto, where they have attended pro-Erdogan events. The Turkish media reported that they were part of a group that travelled from Canada to greet Erdogan in Washington; Alpkenan Dereci said he had previously travelled to Cuba for an Erdogan trip there. “We love him very much and we would like to visit him and talk to him during his visits,” he said. The Washington incident occurred after Erdogan met with Trump at the White House. Erdogan, who has been criticized in Turkey and abroad for his crackdown on dissenters at home, was sitting in his car in front of the residence when his security team began chasing after the protesters standing across the street.